Pretty cute. 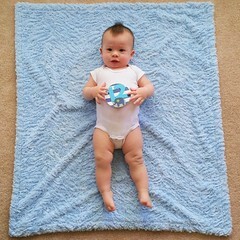 I think I'll recycle the idea for other occasions where banners are appropriate (such as babies). On New Year's day, we went over to my mom's house for a dinner of cold noodle (literally, cold noodles with carrots, cucumber, fried egg, ham, and a garlic sesame sauce) and potstickers. It was delish. I think I took my mom's cooking for granted when I was younger and lived at her house. Now that I'm on my own (and I don't cook as well and often as she does), it's yummy when we have dinner at her house.